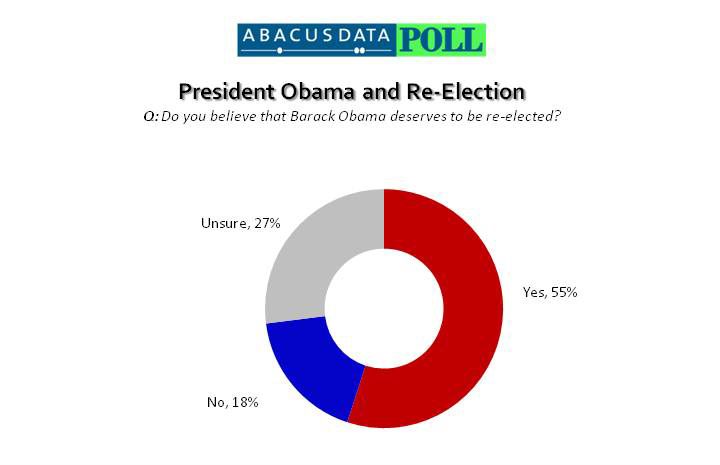 A new national survey from Abacus Data found that over four in ten Canadians (46%) said they are following the U.S. Presidential election either very or somewhat closely while another 55% believed that President Obama deserved to be re-elected. Nationally, 11% of respondents said they were following the election very closely while 35% said they were following it somewhat closely. Three in ten respondents (32%) said they were following the election not that closely while 22% said they were not following the election at all. Men were far more likely to say they were following the election closely than women (men 56% closely, women 37% closely). When asked whether President Obama deserved to be re-elected, a majority of respondents agreed (55%) while 18% believed he did not deserve to be re-elected. Over one in four (27%) respondents were unsure. NDP and Liberal Party supporters were more likely to believe Obama deserved to be re-elected (NDP 66%, Liberal 65%). Although they were more likely to believe Obama does not deserve to be re-elected, 46% of Conservative Party supporters agreed that Obama did deserve to be reelected. A slight majority of Canadians (52%) believed that Obama being re-elected would be the best outcome for Canada while 9% a Republican being elected would be better. Four in ten Canadians (39%) said the outcome doesn’t matter. Although his re-election numbers in his home country continue to sag, Barack Obama remains relatively popular in Canada with a majority of Canadians believing he deserves to be re-elected in November 2012. Moreover, considering the voter turnout levels registered in recent election, it is noteworthy that almost one in two Canadians say they are following the U.S. Presidential election at least somewhat closely. From September 23 to 26, 2011 Abacus Data Inc. conducted an online survey among 1,013 randomly selected Canadian adults from a representative online panel. Although there is technically no margin of error for non-probability samples, the margin of error for a sample of 1,013 Canadians is +/- 3.1%, 19 times out of 20. Results of the survey were statistically weighted by gender, age, region, and education using census data from Statistics Canada and by past vote using Elections Canada results from the 2011Canadian provincial election. Totals may not add up to 100 due to rounding.